Another add on has just been added to our arsenal, this time in the form of a Task Management add on. 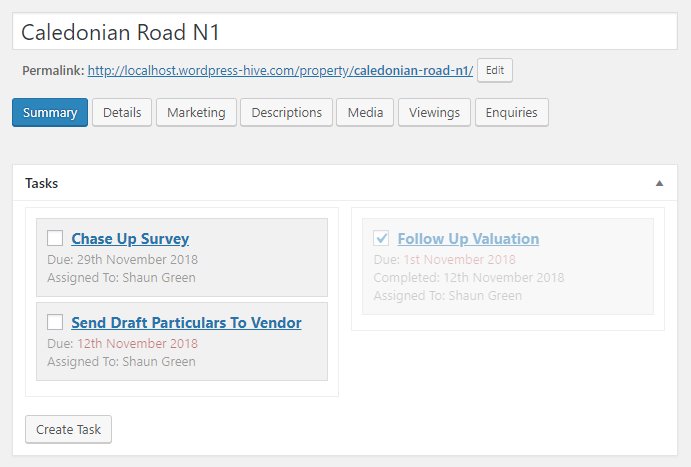 We’re finding more and more people are using Property Hive for WordPress as their all-in-one solution for managing their agency. In an effort to continue this trend we’ve just released a new add on to allow agents to manage their tasks and to-do lists. Using this add on you can add general tasks (e.g. order business cards), or you can assign tasks to properties or contacts where they’ll appear at the top of their record so you don’t miss them. You can assign tasks to a particular negotiator for them to action or add a due date. The add on also comes with a new dashboard widget so you can see open tasks assigned to you as soon as you login to WordPress.